Nations along the Mekong River, including Vietnam, have agreed to join hands for the fair and sustainable use of water resources in the waterway. Vietnamese Prime Minister Nguyen Xuan Phuc participated in the Mekong River Commission (MRC) Summit in Siem Reap on Thursday. The summit also saw the attendance of the premiers of the four members of the MRC, namely Cambodia, Laos, Thailand and Vietnam, along with high-ranking officials from China and Myanmar, the two dialogue countries of the MRC. Speaking at the event, PM Phuc stressed the challenges along the Mekong River, which can eventually result in the depletion of water resources, sediment and nutrients, and the degradation of the environment and ecosystem. The problem is even more serious in regions located along the downstream, namely Vietnam’s Mekong Delta, where prolonged droughts, saltwater intrusion, and subsidence are threatening the lives of over 20 million people. The premier asked the MRC to take measures necessary for the suitable use of water, as well as relevant resources, in the Mekong River. He also urged the commission to focus on building a development framework for the Mekong River, and promote the implementation of cooperation projects between countries in the region. During the summit, delegates affirmed their determination to spur cooperation among partner countries in order to leverage development opportunities and overcome challenges along the waterway. They agreed to apply a set of procedures on the sustainable, reasonable, and equal use of water resources in the Mekong River. 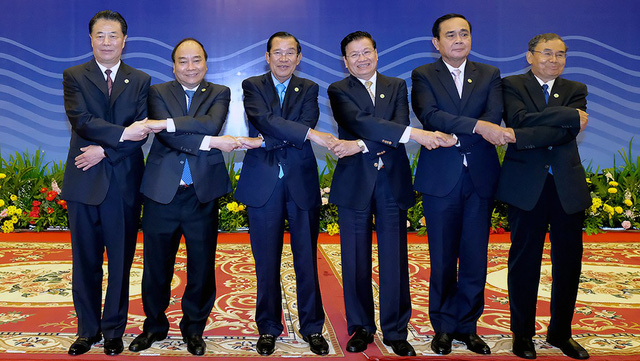 The leaders approved the Siem Reap Declaration, which highlights opportunities and challenges for the Mekong River Basin and affirms the importance of Mekong cooperation as well as the acceleration of the implementation of the 1995 Mekong Agreement. The MRC holds its summit every four years starting in 2010. The first summit was held in Hua Hin, Thailand, and the second took place in Ho Chi Minh City.